“Why do you like peacocks?” – the question popped up in my mind when we were driving to Los Angeles County Arboretum and Botanic Garden to see nothing else but these resplendent birds of the pheasant family. “What makes them so special?” – continued I asking myself. Depicted in many fairy tales and children’s stories as an integral part of an extraordinary, paradise-like garden of a rich master or king, the peacocks have been associated with royalty, guidance, vision and spirituality. For ages these birds with stunning, multi-layered, brightly colored tails and slow gait have been the epitome of grace and elegance. Up to this day, the peacocks stop almost every passerbyer in their tracks making them hurriedly reach for their phones or cameras to take pictures of these adorable birds. Listening to these thoughts inside my head, I was not sure if I was excited or indifferent about our little adventure, but seeing the peacocks in a garden rather than a zoo sounded like a really good idea. Approximately half an hour later, this awesome idea came to life when we reached our destination of the day. 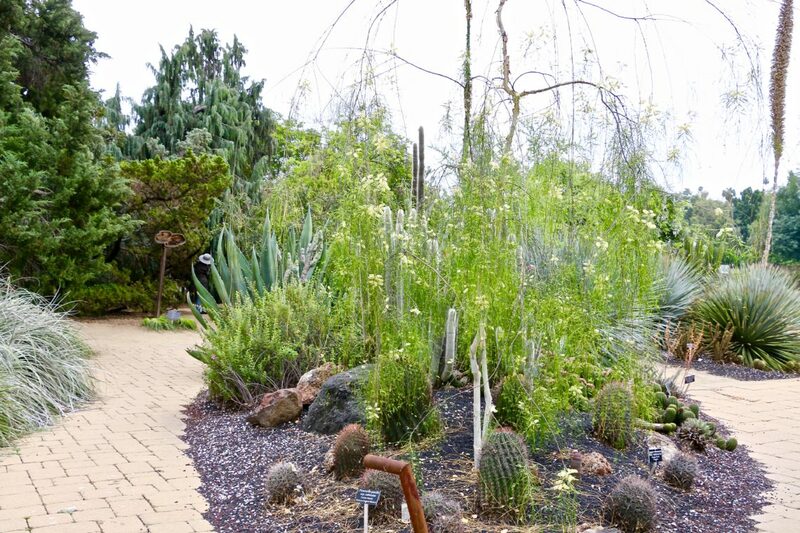 Set near the San Gabriel Mountains, east of Pasadena and across the street from Santa Anita Park, a small Arboretum hides its pride and beauty from intrusive tourists and opens up to mostly locals and those that are approved by the local residents as trusted visitors. Embarrassingly enough, after living in Los Angeles for over 10 years, we did not hear about this hidden gem until just recently. But to make things right, we grasped an opportunity to discover another unique, less-popular place of the city without putting it off for a long time. Coming a long way from Rancho Santa Anita, an agricultural outpost of Mission San Gabriel, to the private property of Yankee capitalist Elias Jackson Baldwin and, thanks to its lavish location, film set for many Hollywood movies, the Arboretum and Botanical Garden has become one of the favorite places of many locals and random visitors alike looking forward to spending a relaxed weekend watching LA’s graceful peacocks. The garden though does not limit itself to only the famous pheasants. 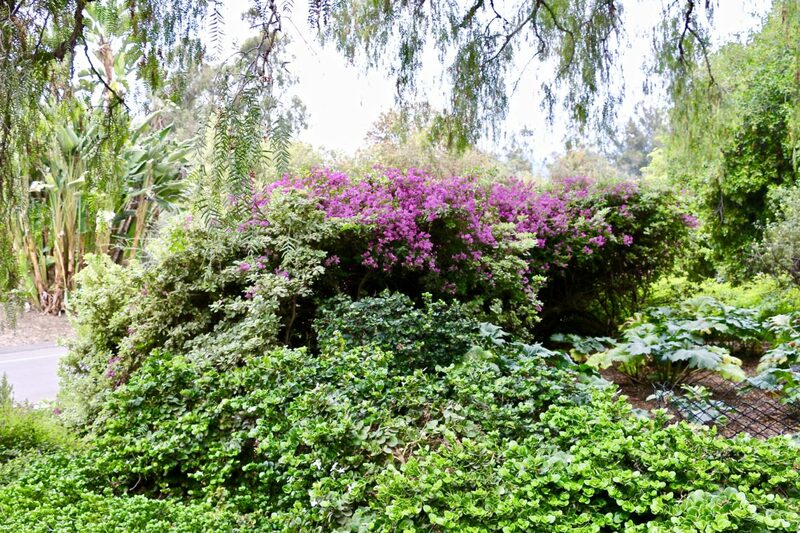 Other features include distinguished geographical and botanical collections such as “Africa”, “Australia”, “Madagascar” and “Canary Islands”, Queen Anne Cottage nestled by the horseshoe-shaped Baldwin Lake, Rose Garden and Meyberg Waterfall. 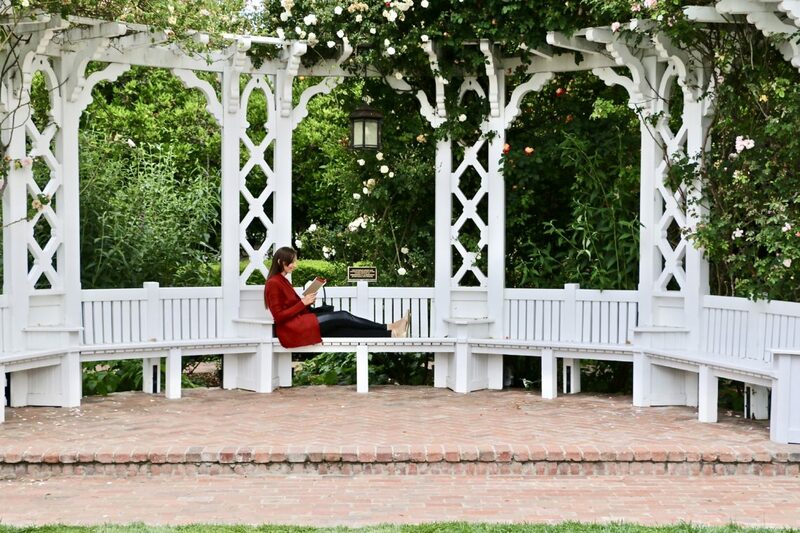 Serenity, peace and natural beauty presented in every corner of the arboretum, embrace and shower you with the feeling of complete appreciation and surrender the moment you park your car in a designated parking lot just a few yards away. The parking situation though might be a bit complicated especially on weekends. So, plan your trip early in the morning to beat the crowd and have not only the Arboretum but also its parking lot all for yourself. Approaching visitor center that also serves as an entrance to the garden, who do you think greets you on a paved pathway just outside the gate? You got it! 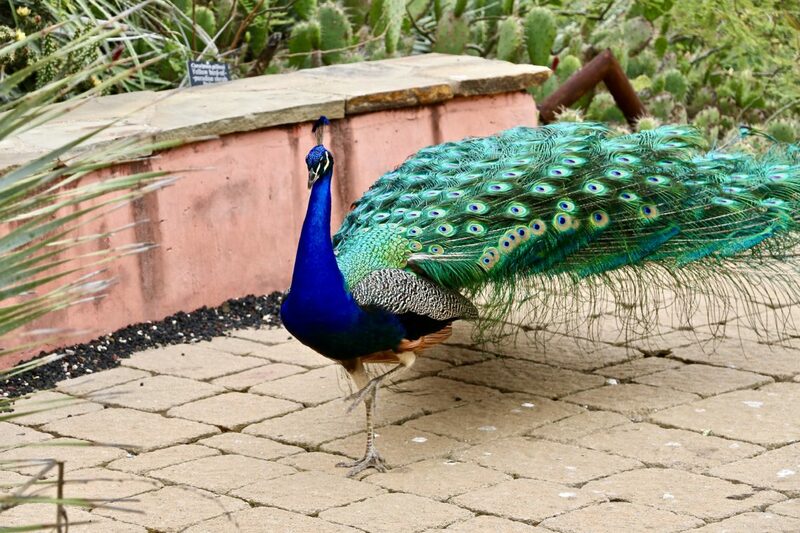 A graciously paced peacock casts an indifferent glance at you while you, anticipating a greater “show”, are heading farther towards the entrance. The bird does not shy away from the people, nor does it shows any discontent in their presence. It just stands there soaking up all “Oohs” and “Wows” coming from the ecstatic visitors. On the other side of the gate, more and more such beauties show themselves to exuberant crowd that cannot stop staring at and trying to pat the peacocks. The birds seem to be aware of their splendid looks and entertain their admirers to the best of their “birdy” ability. Grandly and leisurely turn they around showing all their sides to ever-growing audience. 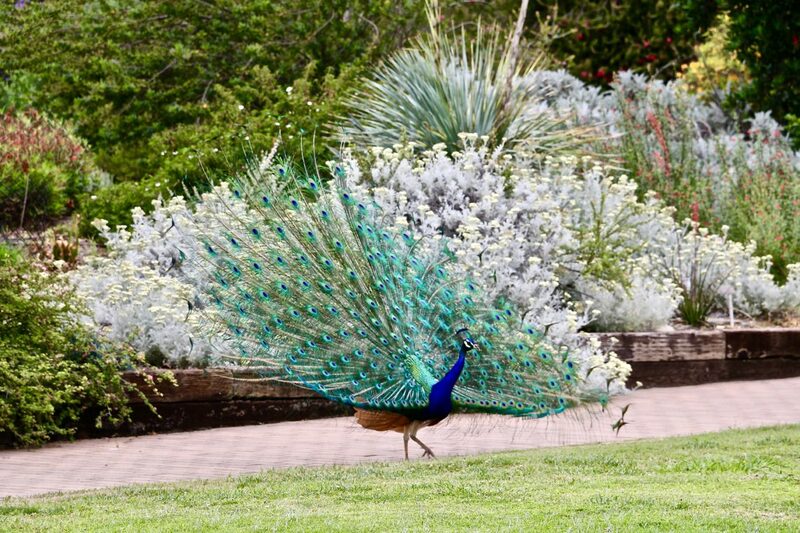 A few moments later a loud shrill sound notifies the crowd that the peacocks are ready to open their gorgeous fan-tails. (Apparently the mighty birds do not want their grand show go unnoticed.) Delighted by the numerous clicks of the cameras that start working unstoppably as soon as they hear the sound-hint, the smart creatures, like professional runway models, once again start turning around proudly displaying their luxurious tails. The show does not end there, at least not yet. If you happened to have some nuts with you, place them on your hand and simply extend it in the directions of the nearby peacock. The next moment you know, the grateful birds approach your “feasty” hand and reluctantly, without loosing their dignity pick one nut after another while rewarding you with a high honor to observe them from a few baby steps away. 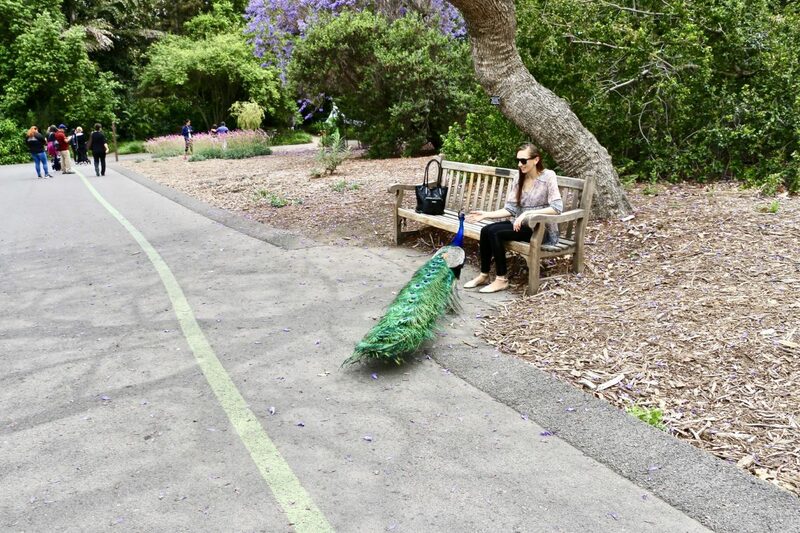 So chasing the peacocks in Los Angeles is not that difficult, after all. 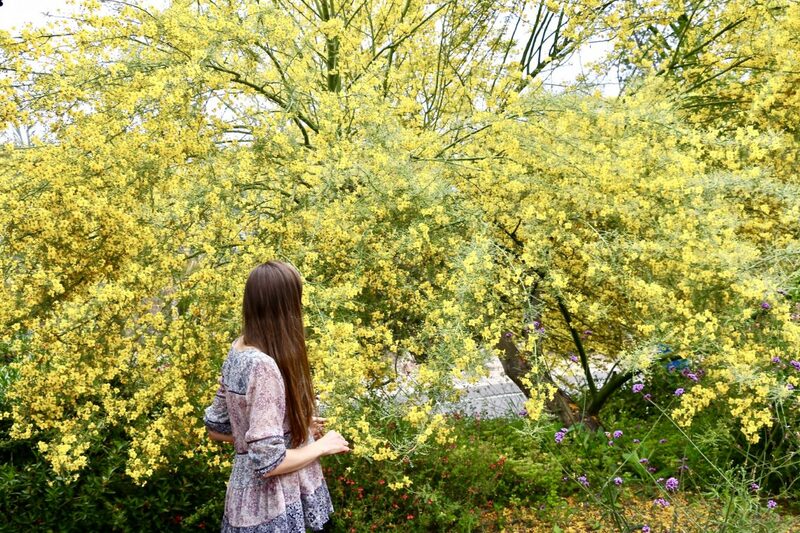 The paradise looking Arboretum would not be an epitome of beauty and peace without it other dreamy components. Start with a remarkable fountain that is a place of interest of many children who try hard to slip away from their parents and dip their little hand in the alluring water. 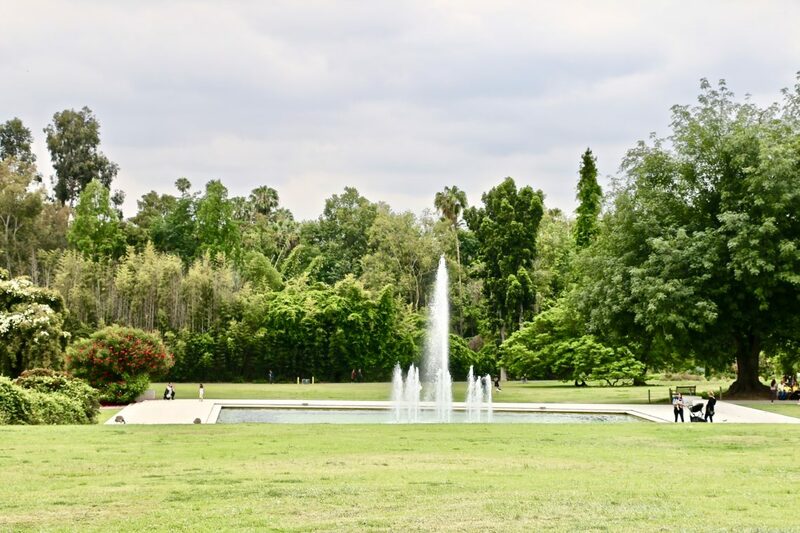 To the left of the fountain and a short walk from the visitor center, a new picturesque world of neatly cut green lawns, stunning summer houses built in Greek style, and plentiful mini gardens opens up to your gaze. Aligning with the paradise-like environment, charming flowers and trees accompany all your walks. Before long, you find yourself in a palm grove with its spectacular green grass that is pretty hard to pass by without sitting down and spending a few moments breathing in fresh air and admiring lavish greenery surrounding you. 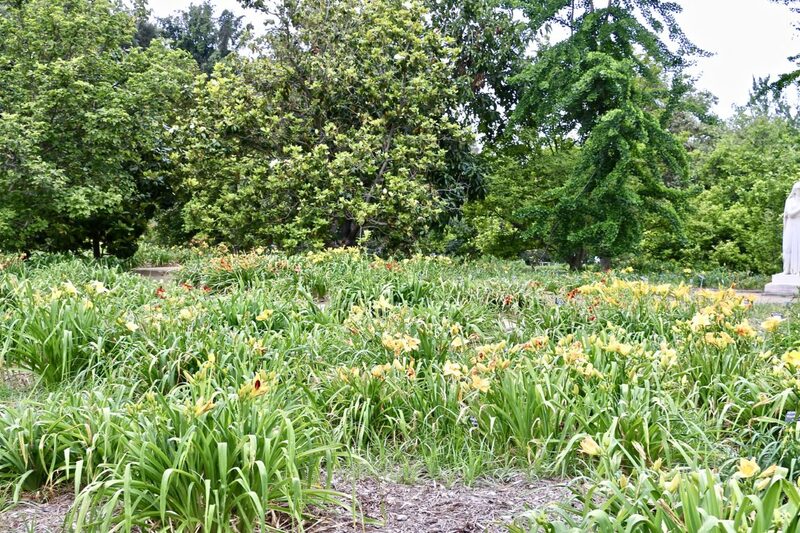 After leaving the palm garden and heading back toward the fountain, turn to your right and follow a paved pathway that leads directly to the Queen Anne Cottage. Build in 1885, a white cottage with red touches and astounding details looks like a house that the modest Snow White would prefer over the walls of any glamorous castle. So beautiful and serene that you yourself will want to make it your personal place of residency! Practically surrounded by a picturesque lake, the cottage used to serve as a “place of refugee” for many of its previous owners searching for a “calm harbor” in a world of constant movement and stress. Over the time, the white house with the red stripes lost it popularity among the rich and famous and slowly was turned into a museum that opens its doors for the visitors only two times a year. Without knowing and less planning it, we were lucky to visit the garden on one of those rare days. Ironically, we still managed to miss the guided tour of the house as we approached the cottage at the exact time when the last visitors, returning shoe covers, were going down the wooden stairs of the house porch. The polite employees patiently watching them to leave the premises locked the house doors as soon as the cottage resumed its lonely existence until Christmas when festively decorated it opens its door again. Nevertheless, you can still walk around the cottage and pick through its windows that, to our surprise, give pretty good clue of the structure and interior of the house. A few feet away from the Queen Anne Cottage, Baldwin Lake fully compensates for the lost opportunity to be one of those lucky visitors that made inside the house and dove into its intriguing history hidden within the old walls. Resembling an enormous horseshoe, the lake filled with swimming ducks instantly charms and attracts, douses on you the feeling of nobility and honor. Following the overall mood reigning at the lake, you find yourself sitting down on a bench facing the green waters of the lake and, imitating an aristocrat of the old days, taking out a book and starting reading it for hours and hours occasionally jotting down your thoughts and feelings. As the day proceeds, loud kids’ laughter, coming from nearby arouses your curiosity and, making you leave the lake, leads to a small rose garden with a big white summer house to your right. Here, while the adults spend their time admiring and sniffing at the gorgeous flowers, the younger visitors seem not to have enough of crawling and playing on the green lawns between the rose bushes. A short walk farther down the paved pathway reveals first to your ears (thanks to falling down loud waters) and then to your eyes a splendid waterfall cozily hidden at the far end of the garden. 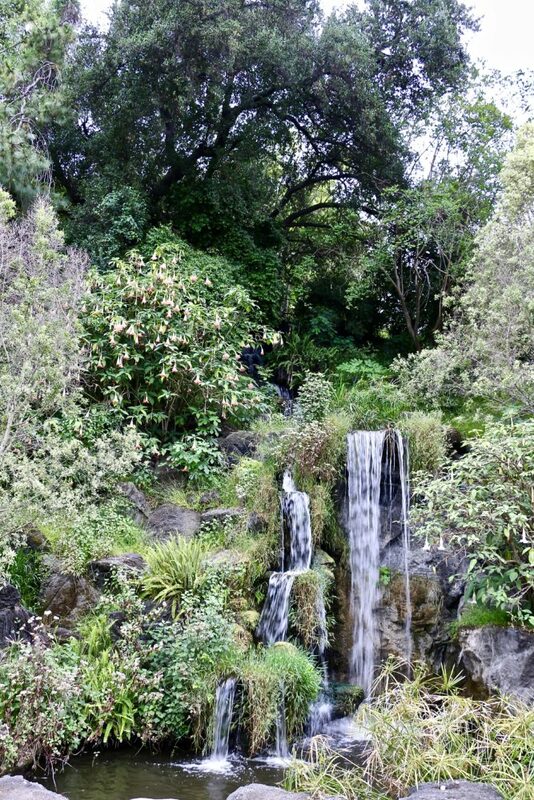 This small, yet charming waterfall is one of the many spots in the Arboretum favored by young couples searching for exotic locations for their professional engagement or wedding photoshoots. 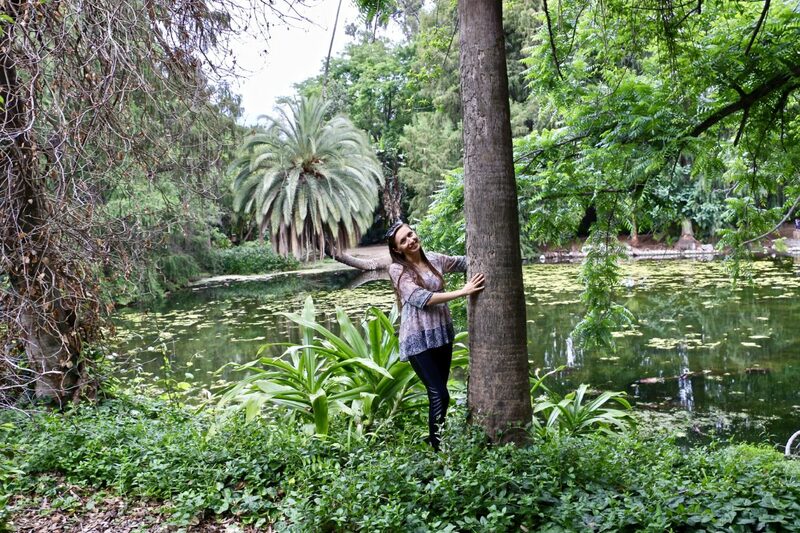 Everybody, small or big, young or old, finds something interesting and pleasant to do and admire at the Los Angeles County Arboretum and Botanic Garden. The place is big, yet small enough to explore it in a matter of a few hours. 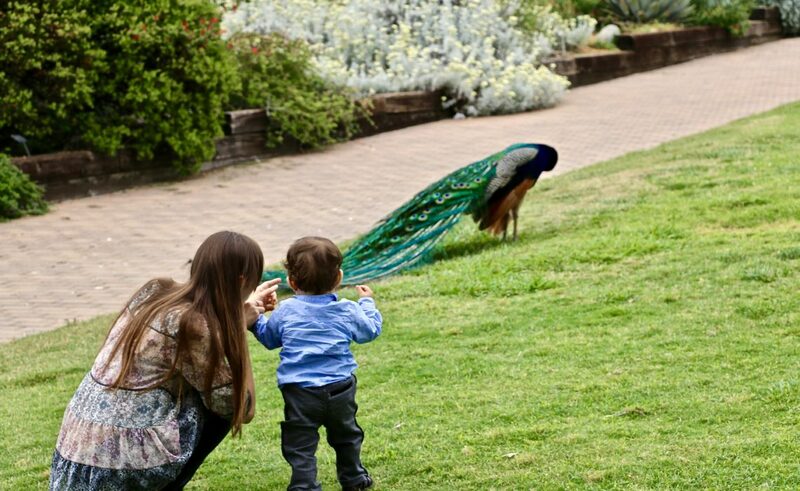 However, if the time is not an issue, take it slowly and explore every single corner of the garden and definitely do not forget to chase its precious hosts, the majestic peacocks.